Another day and another beer that's been recommended to me by a friend, hopefully this one turns out better than the last one! Steve assures me that this beer is one of the best beers in England, and I'm feeling good about this one. It's a real ale (always good!) and I could find the pint glass, so someone likes it! 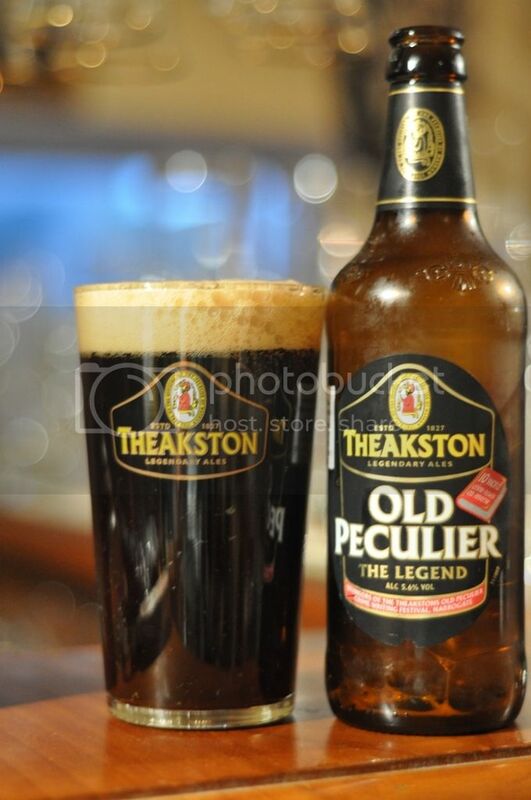 The beers name strikes me as unusual and a quick google lead to the discovery that it is named after the peculie of Masham (the town it is brewed in). A peculier was a parish outside the jurisdiction of diocese, quite interesting I thought. The same google search brought up a bevvy of awards won by this beer, and finally I think we may have found another sensational beer in this challenge, here's hoping anyway! I can't say I've ever had an old ale, knowingly, before. This fact may make it hard to judge how this beer looks for it's style. Ok, so this beer really does pour like a coke, the colour is the same and the head looks the same. The reddish brown colour is excellent and the head lasts for ages. The two finger head seems quite thick, and like any true ale I cannot see any carbonation. Excellent looking beer! On the nose, the beer is simple but complex at the same time. The simplicity comes in the basic malty nature of the aroma, it smells like a malty beer. Then when one takes a closer sniff at these malts, there is a much richer character that comes through. The main flavours I can notice are caramels, butterscotch and even a small licorice bitterness. There might even be a hint of banana. I really like the way this ale smells, my high expectations are getting very excited! WOW! That is the first word that comes to mind when you sample this beer, it is simply spectacular! The beer begins with a sweet caramel and banana flavour, before a earthy hops kick in to balance out the beer beautifully. The aftertaste almost makes this beer, it has a strange sweet fruit and butterscotch flavour and feels quite dry on the tongue. Some might say the beer is a tad thick to drink many of, but due to the low carbonation I believe one could easily down many of these. It really tastes brilliant! This beer is absolutely sensational, and upon reading this review I'm not sure if I've done it justice. If you are a fan of ales, this is a must for you! Steve certainly delivered with his suggestion, much better than my Italian suggestion! The flavours shouldn't offend anyone but should entice an ale connoisseur. I really like the pint glass as well! Definitely get some of this beer, I honestly don't think there are many better English ales that I have had, and trust me I've had a few! I can't recommend this highly enough! Get some and serve it warmish, roughly 10-12 degrees to enhance the flavour, seriously you won't regret it!